Since moving companies over a year ago I've missed my Ubuntu desktop having moved back to development on Windows. I've had a few comments that some of my old Ubuntu blog posts are now out of date and I've wanted a way to ensure that they remain 'correct'. 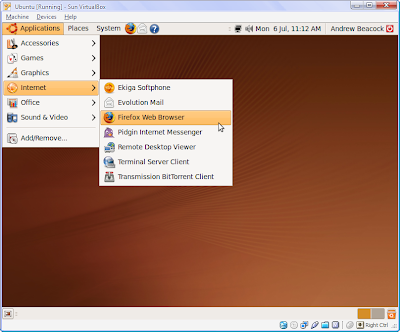 First I downloaded the latest version of VirtualBox (version 3.0.0) and selected the "VirtualBox 3.0.0 for Windows hosts". Then I downloaded the latest version of the Ubuntu Desktop edition. After both of these were fully downloaded I double-clicked the VirtualBox installer and choose to install everything. When the "not passed Windows Logo testing" alerts pop-up choose to "Continue anyway" then register if you wish. 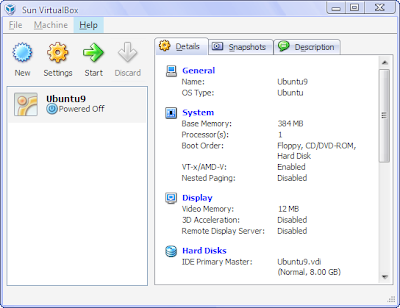 Once it's all installed run VirtualBox and click "New" to create a new virtual machine. On the "VM Name and OS Type" page I entered "Ubuntu9" as the name, and for the operating System I chose "Linux" and "Ubuntu" as the version. On the "Memory" page I chose the default option, same for the "Virtual Hard Disk" setup. Within the "New Disk Wizard" I chose "dynamically expanding storage" for the "Hard Disk Storage Type". This will have just created a new virtual server called "Ubuntu9" in a "powered off" state. 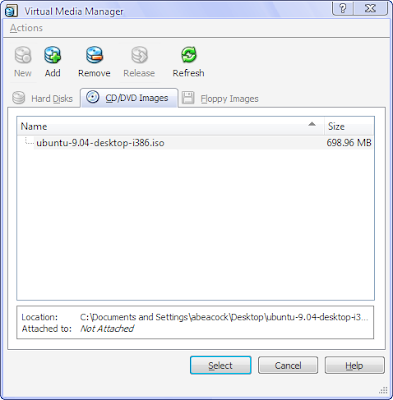 The Virtual Media Manager windows appears. 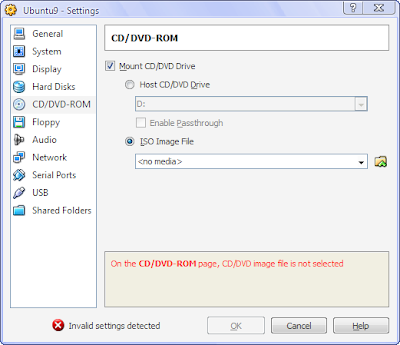 Click "Add" and browse to where the downloaded Ubuntu ISO image was saved and click "Open". Then click "Select". You will now be back at the Settings window, just click "Ok"
The virtual server now starts with the Ubuntu disk image auto-mounted and boots from this image. Use the cursor keys to select your default language and then choose "Install Ubuntu". Ubuntu will start to install and load up the Gnome based installation wizard. Select your language, timezone and keyboard layout when prompted. You will now be presented with the disk formatting screen - choose "SCSI1 (0,0,0) (sda) 8.6GB ATA VBOX HARDDISK"
Ubuntu will automatically install after the disk formatting is complete, this can take a while. If it gets stucks at the "checking mirrors" stage then you might have some issues with the networking setup - the Ubuntu setup wants to be able to connect to the internet. I had to change my network settings from "NAT" to "Bridged" to get it working on my system. That's it you can now use Ubuntu as if it was installed as your primary OS! I never knew that VirtualBox was so popular!